The UbuntuNet Alliance has unveiled its 3 year network upgrade plan which aims at expanding connectivity within its membership region by increasing the number of Points of Presence (POPs) from 10 to 17 by the year 2017. 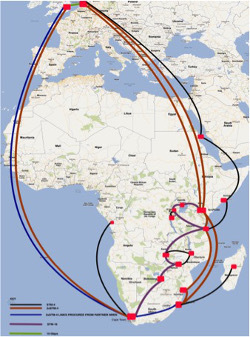 Currently, the Alliance operates 10 POPs with 2 of them delivering global transit in Europe (London and Amsterdam) and 8 POPs located in the UbuntuNet Alliance region, in 7 member countries. But unveiling UbuntuNet Alliance’s network projection plan during the Price and Costing Workshop held on 4-5 August 2015 in Lilongwe, Malawi, the Alliance’s Technical Manager Joe Kimaili revealed that the Alliance wishes to expand its connectivity within the region by adding 7 More POPs in countries where NRENs are not yet connected to the UbuntuNet network. The Technical Manager said the within the next three years, the Alliance plans to add POPs in Botswana, Burundi, Madagascar, Malawi, Somalia, Sudan and Zimbabwe to bring the total number of NREN members being covered by the UbuntuNet regional backbone to 14. The plan, according to the Technical Manager, also aims to upgrade the capacity between Africa and European POPs from the current 2.18Gbs to 5Gbps. He said the projection plan also aims to upgrade from the current 1Gbps to 2.5Gbps on the Eastern seaboard (Mtunzini to Nairobi), the Nairobi to Dar es Salaam via Kigali via Kampala, and the Dar es Salaam to Cape Town via Lusaka, Harare and Gaborone links. Within that period, the 155 Mbps Links between Moanda and Cape Town will be upgraded to 622 Mbps which will be the capacity of the link between Lusaka to Blantyre via Harare while two protected links that will connect Kigali to Bujumbura and Mtunzini to Antananarivo will be of 300 Mbps capacity.